Girl Guides has always promoted the enjoyment and appreciation of the outdoors, exposing girls to ways we can care for our natural environment and improve our communities. This Earth Day we invited Lindsay Coulter, David Suzuki’s Queen of Green, to share some simple ways we can all make a difference. 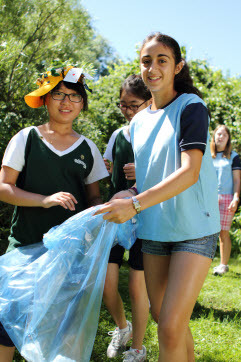 How can girls and women help save the planet? Choose the safest toys: Did you know there’s a Consumer Guide to toxic chemicals in toys? They rank toys and list chemicals of concern. They’ve tested plastic and wood toys for lead, polyvinyl chloride (PVC) and other harmful chemicals. Last year, 20 per cent of the 1,500 toys they tested contained lead. Children’s play jewellery ranked the highest. Don’t be swayed by what looks to be a good deal. Meet the neighbours: Kids can recognize and name more than 1,000 corporate logos but don’t know the names of their neighbours. So ask not what your neighbourhood has done for you, but what have you done for your neighbourhood. We often overlook the fact that human beings do not live in economies – we live in families, neighbourhoods and communities. A few simple selfless acts could make your street a better place to live. Hang a tree swing on your boulevard, organize a street hockey tournament or host a potluck for your block. Little things like this can help us slow down, even just a little, to check-in with the quality of our relationships with family, friends and our community. Protect urban nature: Green spaces like parks and forests are good for the birds and the bees. But did you know that people who live near green spaces are healthier? Green spaces encourage people to be physically active, and being active means reduced stress. Get outside and enjoy a walk in the park. Care for existing parks in your area or write to your city council asking them to create new ones. Get outside: We are raising a generation of kids indoors. A Netherlands study found that today’s children go outside less often and for shorter periods of time. Meanwhile, a New York State researcher found 71 per cent of mothers played outdoors every day when they were young, but only 26 per cent of their children played outside daily. So parents, teach your children well – children who connect with nature grow into adults who care about protecting it. Get outside! By Lindsay Coulter, David Suzuki’s Queen of Green. This entry was posted in Camping & Outdoors and tagged David Suzuki Foundation, Earth Day, eco citizens, environment. Bookmark the permalink.